Driving up the mountain approaching Stone Mountain Vineyards for the first time, as the road keeps going up, up, up through the forest, it seems impossibly high up the mountain! When you finally come out into the clearing where the beautiful wood winery building stands up on stilts, you are hit with a view that is completely unrivaled! Over 1,700 feet high, Stone Mountain is one of Virginia's highest vineyards! 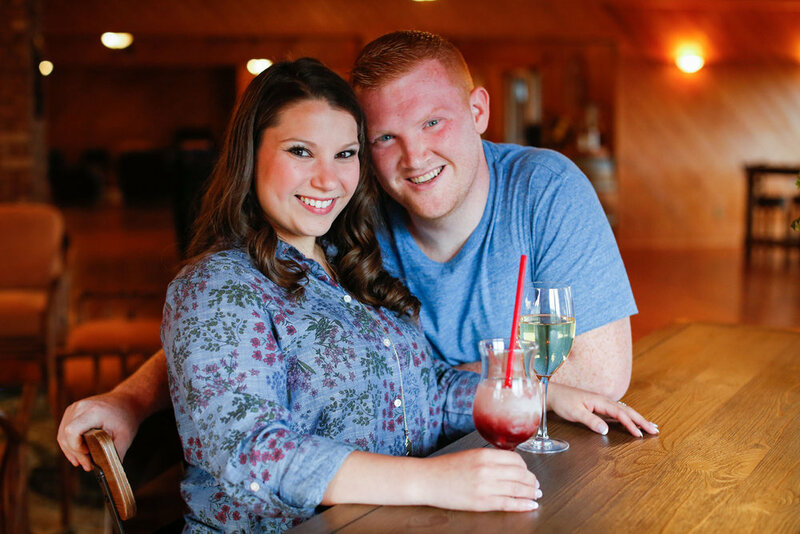 I met Megan and Kevin inside the winery, and I got to hear the story of how they met in college outside a classroom, and later at a Halloween party where Megan was dressed as Minnie Mouse! 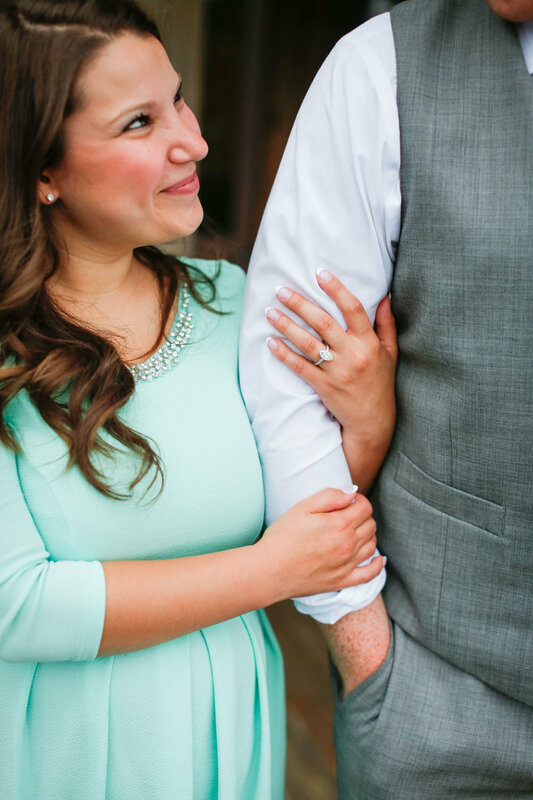 Together ever since, years later, Kevin asked Megan to marry him with a ring in a tiny glass slipper at Disney World (Megan is a true Disney fan!). This is one of the best parts of being a wedding photographer- getting to hear people's love stories at this exciting time in their lives. I'm so happy for these two, who are so clearly in love, and so thoughtful of one another. Wishing them all the best in their journey together!!! 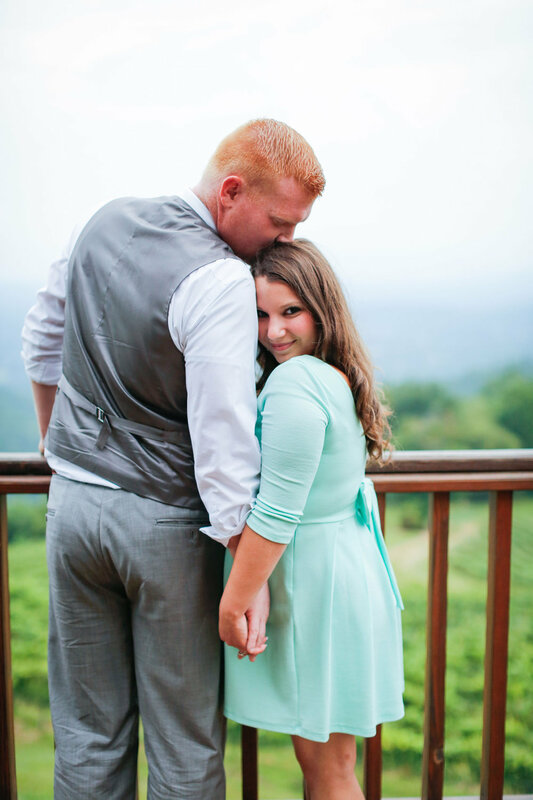 Check out these photos from their engagement session! 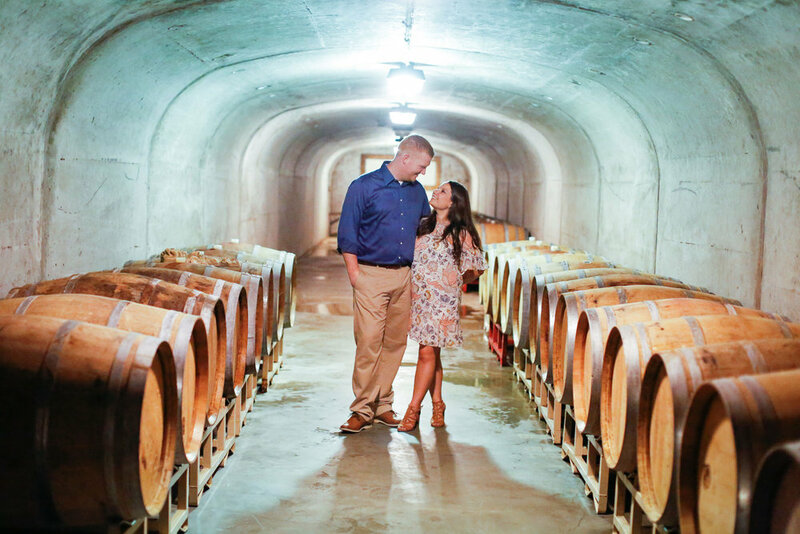 New owners of the winery, Jim and Deanna Gephart, have their own love story, and pouring themselves into operating a winery and vineyard after long careers in the federal government is a beautiful new chapter in their lives, and a dream come true for them!! Lexie and Emily chose Charlottesville, Virginia’s unique IX Art Park for their engagement photos. I knew we would have fun there since there is so much to explore in the way of weird, wonderful public art. There are some park-like areas with long natural plantings and grasses, and some urban looking areas with giant murals and interactive sculptures. There’s a big wall there saying “Before I Die I want to….” and below that, lots of lines and chalk for people to write their hopes and dreams. Each time I visit IX, I love to see what the latest visitors have written on those lines. I thought it would be a great ice breaker to start the session with Lexie and Emily writing out 3 things that they wanted to do before they die- I told them to pick one thing they want to do for themselves, one thing they want to do for the other, and one thing they want to do together. You can see what they wrote in the pictures below! These two were so fun and easy to work with. They were super comfortable and relaxed, and a little bit giddy! They were always being funny and making each other laugh, and always smiling! They got engaged at Disneyworld, and they brought some Magic Kingdom and Epcot mugs they bought there which we played around with at one point in the shoot. 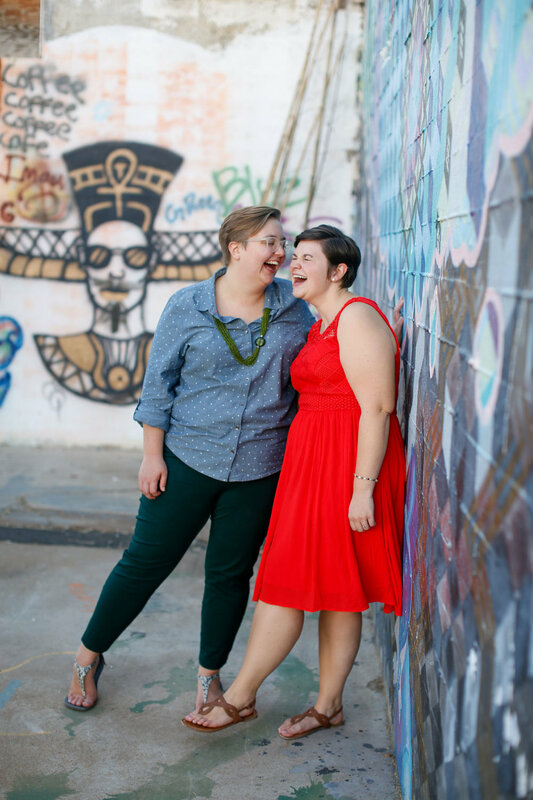 When Lexie and Emily first contacted me about doing a fall engagement shoot, they asked if I was LGBT-friendly. And I replied “Of course I am! (And I hate the fact that you have to ask me that question at all. )” For the record, in case anyone wants to know, I love lesbians, gay men, bisexual people, transgender people, and I love cisgender people too. I love all people. Everyone must be true to themselves! And Love is Love. I’m a big supporter of Marriage Equality. It was a very happy and historic day last year when gay marriage became legal in all 50 states. 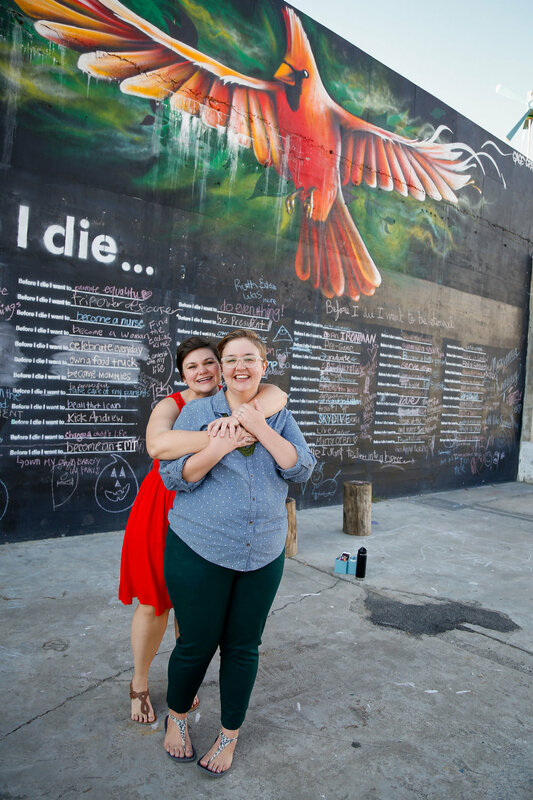 And now amazing, joyful, devoted couples like Lexie and Emily can be legally married to match the commitment they have already made in their hearts. For their engagement shoot, Steve and Annie wanted to revisit the area where Steve had proposed. Earlier last year, they had planned a hike up to Humpback Rocks along the Blue Ridge Parkway, and when they reached the top, Steve proposed! Months later, their engagement session with me was on a sweltering hot day in August, so we decided not to do the full hike to the top. Instead, we did photos down by the Humpback Rocks Visitors Center, where we found areas full of wildflowers, cool old fences, an old cabin, and plenty of nice places for photos. Then for sunset, we drove ten minutes up the road to Raven's Roost Overlook for some epic mountains photos! Annie had worn flat sandals - a must if you are shooting at the overlook! Thanks to Annie and Steve being very willing to try my suggestions, we got some really exceptional shots. Standing on top of the wall at Raven's Roost, as well as climbing down around the wall is not for the faint of heart! And to get those photos of them immersed in wildflowers...they had to brave some poison ivy which was way too close for comfort, but they climbed over the fence, and got out of there without any poison ivy outbreaks, thank God!! 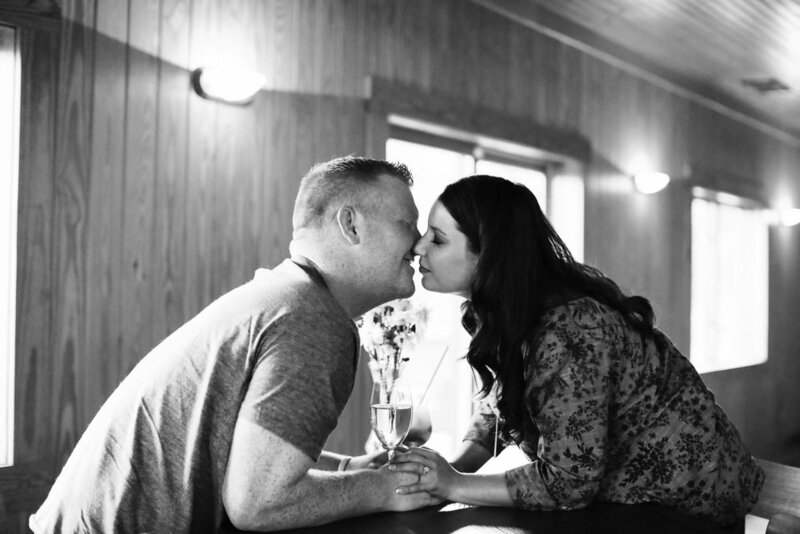 Besides their adventurousness, their love for each other made these photos truly special- I could really feel the love they had when they looked into each other's eyes. I was so excited when Cody contacted me to ask if I would photograph him as he proposed to his girlfriend Mady at Stinson Vineyards, in Crozet, VA. This type of shoot is so fun because there's an element of sneaking around which adds another dimension to the shoot. Cody and I worked it all out ahead of time. I would wait at the edge of the rows of vines pretending to be very interested in photographing close-ups of grapes on the vine, while Cody and Mady finished up a glass of wine at the tasting room. Then, Cody would suggest a walk down the vines...I would follow and be ready for him to drop to a knee and propose! 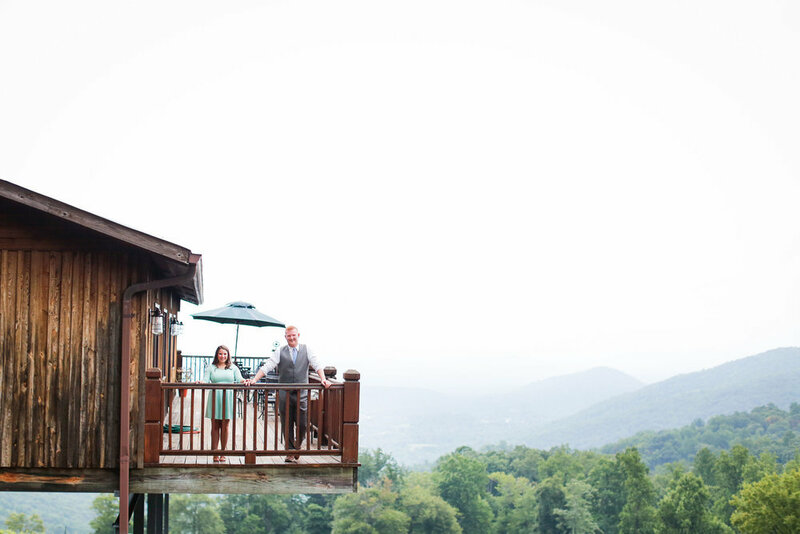 The day arrived and the vineyard had such epic views of the blue ridge mountains, I knew the photos would be epic! As I pretended to photograph grapes (well, I really did photograph the grapes...), I got a little nervous myself, worrying that Mady would figure out what I was up to...but they walked right by me and I followed them secretly, hoping she wouldn't hear my camera's shutter or turn around since we were the ONLY people in the vines (and that might be a little creepy to see someone following you...), but it all went off absolutely without a hitch. Mady didn't notice I had followed them at all, and when Cody dropped to a knee, it was so beautiful. It was an honor to be there as the only witness to see Mady's surprised and overjoyed expression, and all in the most gorgeous setting... They reveled in the moment and when Mady finally started becoming aware of me, snapping away at that point, it was funny to see her realize that Cody had hired me. At one point, someone who worked at the vineyard called through the vineyard "Congratulations!....I literally heard it through the grapevine!" Ha ha ha! I loved that moment! I could shoot a surprise proposal every day, it is so fun! My husband actually hired a photographer to be there secretly when he proposed to me in 2009 on Miami Beach at sunset, and I cherish those photos...that's where it all began...and now we are happily married with two beautiful kids! 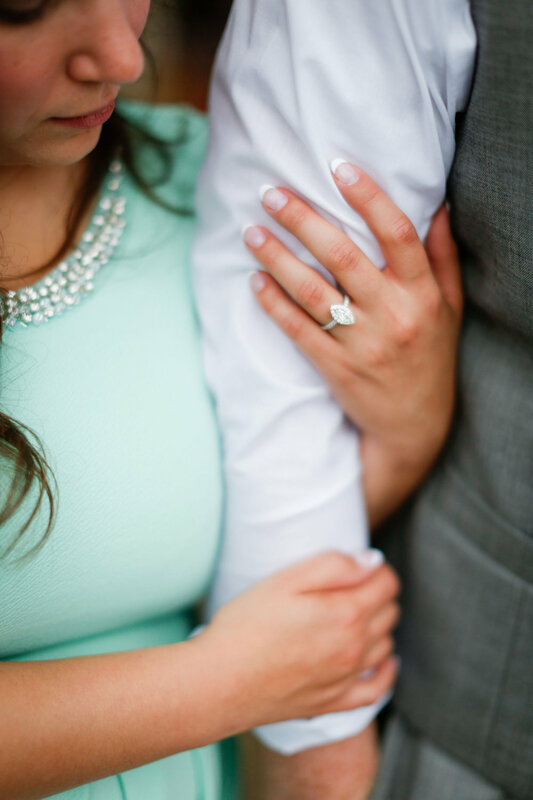 When a guy hires a photographer to be there as he proposes, you know he has really thought carefully about this important moment and that he wants to take care of your memories together, which I think is just so sweet. Suzanne and Tim are getting married in downtown Charlottesville, just off the downtown mall, so knowing we'd get lots of urban shots of them on their wedding day, for their engagement photo session, we decided to go have a nice afternoon at a vineyard with a beautiful Virginia view. We chose Early Mountain Vineyards in Madison, VA, and had a great time exploring the grounds. Blue ridge mountain views, rows of vines, beautifully manicured gardens and stone walls, an old barn, fields of long grass in the setting sun....ahhhh. And after shooting we went inside and kicked back on some sofas with a nice glass of wine and enjoyed some live music inside! These two have a great love story. I'll share more of that with their upcoming wedding photos! I can't wait to hear these two say "I do"!! This was one of the most fun engagement shoots I’ve ever done! 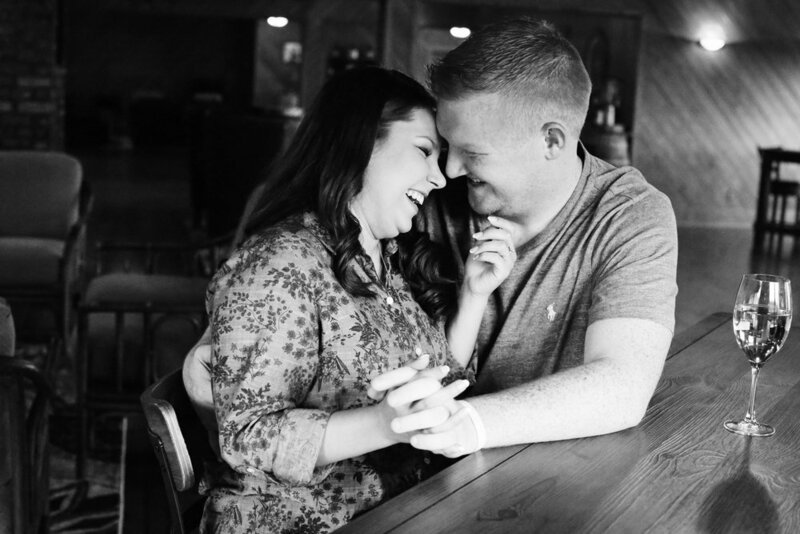 When I first spoke to Elisabeth and Chet, we talked about doing their photos on Charlottesville’s Downtown Mall since they had their first date at Yearbook Taco, and because Elisabeth used to work at a boutique on the mall. Also since their wedding was going to be on Chet’s family’s farm, with reception at historic Ash-Lawn Highland, I knew they’d end up with nice Virginia countryside and mountain view portraits, so the downtown mall seemed like a chance to get some fun downtown photos of this stylish couple. 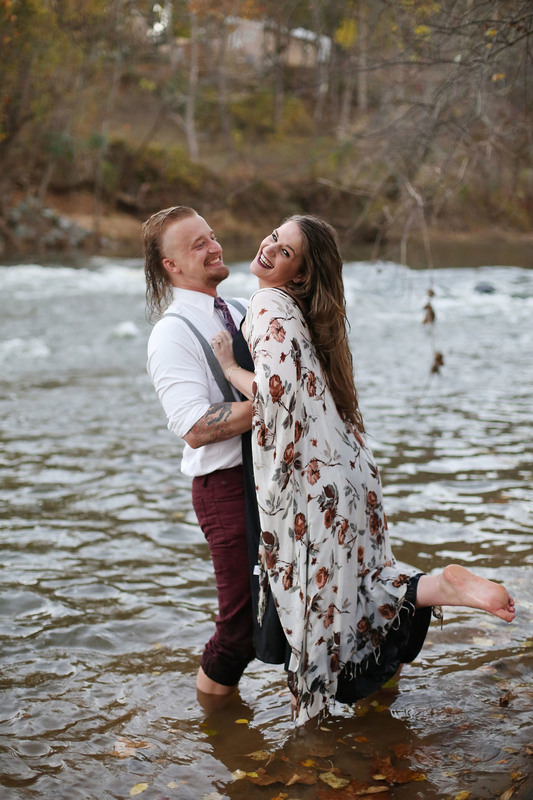 I sensed that they might be up for something a little more adventurous too…so I threw out there “I’ve always wanted to do an engagement shoot where the couple goes all the way into some body of water and gets soaking wet!” They immediately said, Yeah- that would be fun! And Elisabeth quickly dreamed up an appropriate wardrobe change for the water scene photos. Now when I suggested this…I was thinking summer or early fall….I did not foresee that our engagement photos date would end up being in November! Did we scrap the water scene photos in 40 degree weather? Nope! They were still game, and I was still eager to see what photos we could create, so we forged ahead, and here you can see the results! Rachel and Austin wanted something natural and outdoorsy for their engagement photos, so we chose the Ivy Creek Natural Area in Charlottesville, which has fields of long grass and flowers, forests with hiking trails, creeks and reservoir. Austin has just moved to Charlottesville to attend UVA School of Law, and Rachel moves here as soon as they are married here next month! We shot in the hour before sunset, first in the fields, and then down by the creek deep in the woods. We were having so much fun, we lost track of time and barely made it out of the woods before dark! I'm so excited for these two to explore all that this town has to offer as part of their first few years of marriage! Welcome to Charlottesville, you two!